At 85 Bert Rockower of Heritage Oaks subdivision in Port Charlotte, consults his notes while telling his story about serving in the 84th Infantry Division during World War II. Cpl. 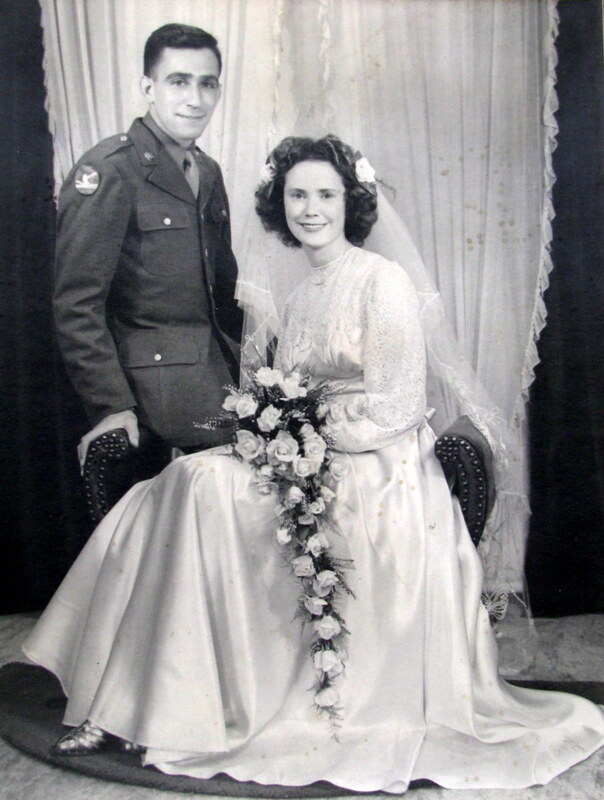 Bert Rockower and his new bride, Joan, on their wedding day during World War II. She was a war bride. They were married at her home in Pinner outside London. Bert Rockower was a corporal in the 9th Army that landed on Omaha Beach five months after D-Day during World War II. By then U.S. troops had advanced across France and liberated Paris. American forces were at the Siegfried Line, the massive concrete and steel fortification protecting Germany’s Western Front. “It was just before the Battle of the Bulge, early December 1944, and our outfit, the 334th Regiment, 84th Division, moved into battle in Holland. Our objective, Prummern, Germany a little town on the other side of one of the most heavily fortified areas in the world,” the 85 –year-old former infantryman who lives in Port Charlotte, Fla. explained. “We were about to go into battle. I saw Malinowski who owed me a couple of bucks from a poker game the night before,” Rockower recalled six decades later. “’Let me pay you because I may not be here tomorrow,’ his buddy said. “Malinowski was killed by a German machine gunner before the day was done. Facing the soldiers of the 334th was an open field several hundered yards deep. At the end were machine guns housed in concrete and steel pillboxes with interlocking fields of fire manned by soldiers from the German’s crack 9th Panzer Division. “The Germans started shelling our position. The shells were getting closer and closer. I moved forward into one of the shell holes. I had company, a BAR man (Browning Automatic Rifleman) jumped in the hole with me. In the middle of all the chaos he started cleaning his rifle. The BAR man had lost it,” Rockower said. “We continued our advance toward the enemy pillboxes. I saw an American soldier in front of me leaning against one of the machine gun nests protruding from the ground. I thought he might be wounded so I made my way over to him. He was dead! “Once we reached our objective we climbed atop the concrete pillboxes and dropped smoke grenades down the ventilation system to smoke the Germans out. They came out firing their weapons. We captured 15 and killed the rest,” he said. “We took our prisoners back to a compound behind our lines. I was one of three or four guys detailed to take the Germans to the holding area. We were almost back to where we would drop them off when I was hit by a sniper’s bullet. It went through my neck and exited through my right shoulder. I spun around and collapsed,” Rockower vividly recalled. “One of the other soldiers guarding the prisoners saw me go down. He stayed with me. While I was lying on the ground my buddy took a miniature Bible I was carrying and read from the Book of Psalms. A medic came by and gave me a shot of morphine. As I laid there American bombers flew over headed for Germany. “A couple of guys from my squad stopped and told me, ‘We got the sniper.’ That made me feel better. “I was taken to a hospital in Brussels, Belgium staffed by American nurses. When I woke up my arm and shoulder were in a cast. Later I was flown to England to a hospital in Winchester. “It was there I learned I was the sole survivor of my 12 man squad that attacked the German pillboxes along the Siegfried Line. To this day I still think about those men,” the old soldier said. “A Red Cross girl was making the rounds of our ward talking to each of us. She asked if there was anything she could do for me. I told her there was a WREN (Women’s Royal English Naval Service) named Joan, a Morse Code operator at the nearby naval air base, I wanted to get in touch with. I explained I met her at a dance before going into battle. “The next day Joan showed up in her naval uniforms with two of her girlfriends who were also WRENS and in uniform. They went around talking to all the wounded soldiers. The ward was transformed from a room of despair to a lovely place. She went out with Rockower on many occasions when he returned from battle. “After I got out of the hospital I was assigned to SHAFE (Supreme Headquarters Allied Forces Europe) in Grosvenor Square. It was 30 minutes from where Joan’s family lived in Pinner – outside London,” he said. After the war, when the young couple came to the United States, Rockower continued his education. He had graduated from high school at 15 and at 17 was finishing his second year of engineering in college when the war broke out and he enlisted in the Army. He graduated from Columbia University in New York City after the war with a mechanical engineering degree. He ended up in the space program. Apollo 7, that orbited the Earth for 11 days in 1968 with astronauts Walter Schirra, Don Eisele and Walter Cunningham aboard, was guided to its rendezvous in space by a gyroscope Rockower helped design and build. At the time he was working for MIT. After retiring, he and Joan moved to Port Charlotte in 2000. She died three years ago. They were married 62 years. They have three grown children, Mark in Port Charlotte, Geoff in Lexington, Mass. and Gail in Tewksbury, Mass. Unit: 334th Regiment, 84th Division, 9th Army. Commendations: The Purple Heart; Combat Infantryman’s Badge; European, African, Middleastern Campaign Medal; American Campaign Medal; World War II Victory Medal and Good Conduct Medal. He served in the Rhineland Campaign before being wounded. Children: Mark, Geoff and Gail Rockower. This story was published in the Charlotte Sun, Port Charlotte, Fla., March 12, 2010. It has been republished with permission. Click here to view the collections in alphabetical order in the Library of Congress. This veteran’s story will not be found in the Collections. His interview was conducted long before our involvement with the VHP. Bert Rockower, 93, of Port Charlotte, FL passed away on Saturday, May 5th, 2018. He was born in Brooklyn, New York on October 23, 1924 to the late Samuel and Hattie Rockower. He graduated third in his class at Stuyvesant High School and went on to attend The University of Michigan. When the U.S. entered WWII he left college to enlist as an officer, but ended up in training with the infantry. Bert served in the 84th Infantry Division of Abe Lincolns Rail Splitter, the 334th regiment, Company A, first platoon. His squadron was sent into the conflict in the most heavily fortified area of Germany, the Siegfried Line. Bert was the sole survivor of his squadron taking a German sniper bullet through his neck and then through his shoulder. He had various shrapnel damage and a bayonet wound to his thigh. He was awarded the Purple Heart as well as the Bronze Battle star for his service to the country. After the war, he married Joan Clayton of Pinner, Middlesex, England who served in the British Air Force as a Morse code operator to the Allied Invasion. They were married on August 11, 1945 in England and later came to the United States to reside. They were married 62 years until Joan passed in 2007. Bert Rockower came back from the war and graduated from Columbia University as a Mechanical Engineer. Later he attended Northeastern College where he received his master’s degree. 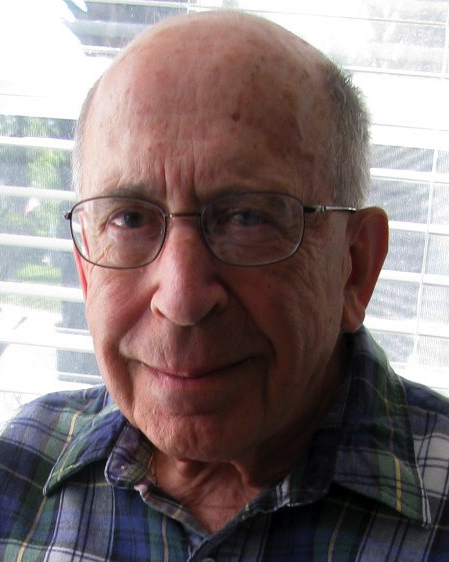 During his career as an engineer he designed jet engines at G.E. and participated in the design of guidance systems used in the Gemini and Apollo space crafts as well as the Trident missiles launched from submarines. Bert also was a teacher at the Massachusetts Institute of Technology as well as Northeastern and Boston College. He is survived by his sister Barbara Lehrman of Connecticut; his three children, Gail, Geoff, and Mark, and two grandchildren, Kayla and Nicole. Funeral Services will be held in the Boston area at a later date. British lady! Thanks to him for his great service to the USA!